Laurie Everton is an '80s glam fan. Laurie Everton is an artist. Laurie Everton is a doll collector. Laurie Everton combines all three loves when she creates celebrity ooaks, dolls that she repaints, reclothes, and restyles to look like certain celebrities. She took a few minutes to speak with us about her unique profession. Hello, Laurie! Thank you for taking the time to answer a few questions for us today. Hi! Happy to do it. You create portrait ooaks. Can you tell everyone what portrait ooaks are? 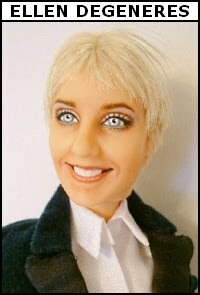 A portrait ooak is a one-of-a-kind doll made to look like a certain person (celebrity, or even someone's sister). Celebrities are the easiest because you can get all the pics you need. I have done people I've never met, non-celebrities. Those are harder because all I have to go by is what pictures the buyer has sent me. Do you exclusively use Barbie and Ken dolls for your ooaks? If not, what other kinds of dolls do you use? I use Barbie and Ken alot, simply because you can play around with the facial features more. I also use the larger 16-inch Tonner dolls. I redo those too, but they are almost always actors and actresses. No rockers yet. The "Rockin' the '80s" series will be all Barbie/Ken size. How did you get into this? What made you want to create portrait ooaks? I'm a portrait artist, been drawing portraits for years and years. This is the same thing, but different medium and canvas. I'm also a doll collector. I just combined the two loves. How long does the process take? What does it entail? It usually takes a couple days after I have the doll to use, which can take many days to find. First, I remove all the old face paint and repaint it, after first looking for the best pictures on the Internet to paint by. I restyle the hair and then dress them in something appropriate. That's a VERY basic step-by-step. What makes you decide to tackle different celebrities? Do you have a certain celebrity in mind and find a doll to work with or do you discover a doll that kind of looks like a celebrity and go from there? I've done both, but the ideal is to find the doll with the celebrity in mind. Of course, there have been several times now that I've looked at a doll and immediately thought of a certain celebrity, and end up doing that celebrity. 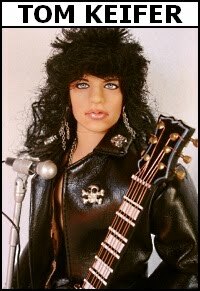 Your Jon Bon Jovi and Tom Keifer dolls look amazing! I was a big glam fan in the '80s. Can you tell us what other musicians we'll see in your "Rockin' The '80s" series? I will probably end it with Bret Michaels. I've done a few of him and that doll is what got me started on the '80s rockers. I have a few I'm considering, which will depend a lot on if I can find a doll to work. Tommy Lee or Nikki Sixx from Motley Crue would be on my list of favs, but finding clear pictures with all their tats seem impossible. David Lee Roth would be interesting, as would Angus Young from AC/DC. Joe Elliott from Def Leppard, Gene Simmons (without the makeup! ), Dee Snider, Enuff Z Nuff (Chip or Donnie) Joan Jett, Lita Ford, Whitesnake, Warrant, Ratt, Slaughter, LA Guns, Firehouse, etc. Since there are so many I like from that era (LOVE glam rock of the '80s), the possibilities are endless – and there isn't any rocker from that era I wouldn't consider. Of all the celebrity ooaks you've created, which has been your favorite? I don't have a favorite, I have a few. Definitely the recent ones from the "Rockin' the '80s" series. I put more into them, and really did them for myself, hoping others would like them, too. I really liked the Lita Ford one, too. And Cherry Darling, the character from the movie Planet Terror, played by actress Rose McGowan. She even had a machine gun leg just like her character. I know Ellen DeGeneres knows about her celebrity ooak [see footage of Ellen's reaction here]. Have you been in contact with other celebrities? What did they think? A few. I did a one-of-a-kind Lita Ford from her latest CD, Wicked Wonderland. Karen Holshouser made the outfit. All proceeds went to breast cancer. Lita liked the end result and gave her input, which of course helped a lot. Cherie Currie and Jackie Fox from the Runaways for a future project. Of course, I would love to be in contact with every celebrity I do. Having them be a part of it would be awesome and I would donate a portion to their favorite charities just to have them involved! I'm still working on reaching Tom Keifer and Jeff LaBar. And yeah, Demi Moore would be awesome since she is a doll collector. I saw where you're planning on doing a few Brat Pack actors as well. Any chance we'll get a Breakfast Club set? Oh, that's very possible. I love that movie! I'm contemplating every one of those actors/actresses. Again, it will depend on if I'm able to find a suitable doll, but I will do as many from that movie as I can. Ok. Thanks again! We'll be sure to contact you when we're ready to release our limited edition line of Culture Brats dolls. Oh, I will look forward to that! And thank you! Want more Laurie Everton? Visit her homepage, her eBay page, or her Facebook page.